After the Leeds Against the Cuts meeting at 6PM on Thursday 14 June 2012 at Leeds TUC Centre. Please consider attending the gig and social night in support of Positive Action for Refuges and Asylum Seekers (PAFRAS) below. A line-up of local music spanning jungle, reggae, tubas, handlebar moustaches, indie, and psychedelic blues. THURSDAY 14 JUNE 2012, WHARF CHAMBERS, WHARF ST OFF KIRKGATE, LEEDS. 6PM-11PM. £4 IN. VEGETARIAN CURRY AND PIES! PRIZES! CHEAP DRINKS! The next meeting of Leeds Against the Cuts will be at Leeds TUC Centre, 88 North Street, LS2 7PN on Thursday 14 June 2012 starting at 6pm. Please come along to share ideas about how we can fight against the coalitions cuts in Leeds. The next meeting of Leeds Against the Cuts is this Thursday 17th May at 6 pm @ Leeds TUC, 88 North Street, Leeds LS2 7PN. 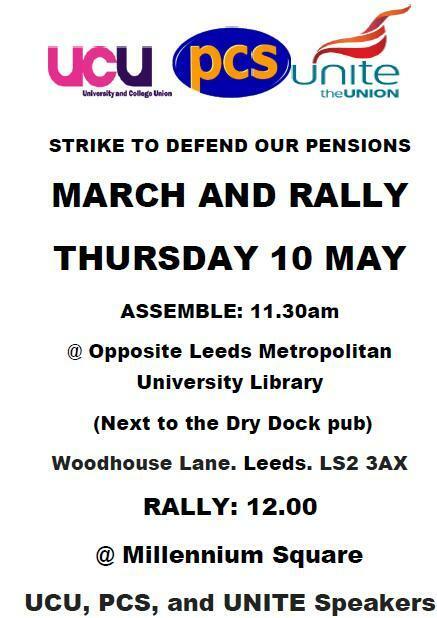 We will be discussing Mayday, the pension strikes and what we can do next in Leeds as an anti-cuts group linked to the unions and TUC. So please come along and let's put our heads together on how to make the ConDems' summer a hot one! The Leeds Strike Day Rally in support of the M10 industrial action by PCS, UNITE and UCU will take place at millenium square tomorrow at 12:00 noon. Bring your banners and show your support and say to the government 68 is too late.